The Discovery Home and Leisure channel recently featured Speedway in their "Petrol Heads" motorcycling programme. 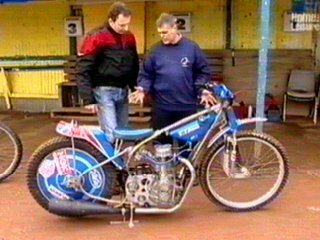 Mick Coombes of the Southern Track Riders Association was our guide as he took presenter Robert Taylor through the essentials of riding a Speedway bike. 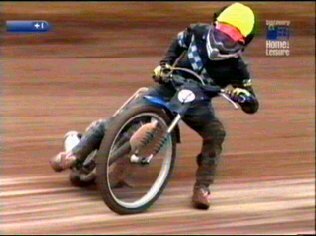 Robert is an experienced motorcyclist but the skills required to slide a Speedway bike are quite different from those required in other disciplines. 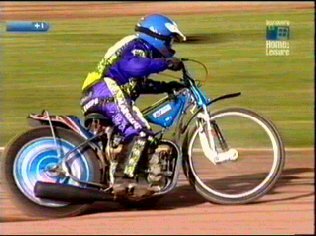 A quick overview of the bikes was enough to reinforce these differences as Mick pointed out the design features peculiar to a Speedway machine. The contrasts between a modern machine and a vintage Douglas were also apparent as the two machines were compared. 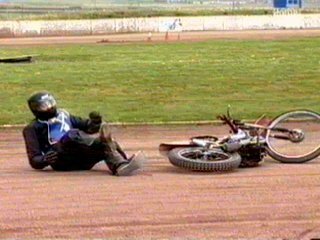 Robert's training took place at the junior track at Sittingbourne and, after a few laps on a 125, Mick thought it was time for Robert to attempt a proper powerslide. Mick's step by step instructions to achieving a powerslide. Robert paid heed to this advice and was soon completing full laps in reasonable style. A move to the full size circuit and to a 500cc machine was the next step. 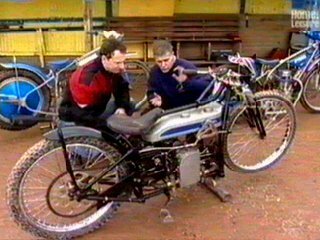 Robert's progress continued, despite a fall, and Mick considered that Robert was ready to take a place in the following day's Southern Track Riders meeting at King's Lynn. A second place in his first ride was an excellent start but foul weather forced an early end to the day's proceedings. 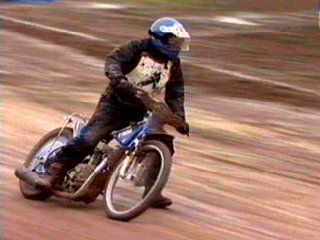 Robert clearly enjoyed his short Speedway career and commented - "Once you reach a certain level, with the ability to broadside a machine into corners at speed, it must be such a buzz." The programme also featured contributions from some of the other competitors such as Jessica Lamb. Jess, fresh from her spell in Australia, spoke articulately about her career to date and summed up the attractions of the sport as follows - "It's so difficult to learn to slide a bike, that when you do it, it's such a thrill". Keep an eye on the schedules - it's bound to be repeated sooner or later.